The freak pre-Halloween snowstorm delivered a particularly nasty blow to cities and towns along Interstate 495, in some communities causing power outages to practically all homes and businesses. 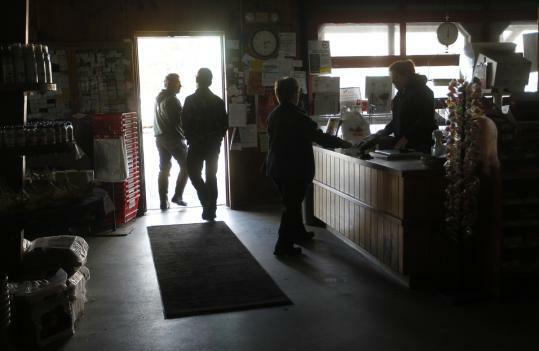 Northborough had lost electricity completely by Sunday afternoon, and the community’s ordeal lasted for days, with nearly a third of the town still in the dark Wednesday, according to updates posted online by National Grid. The damage and resulting power outages from last weekend’s storm was worse than even Tropical Storm Irene and the infamous 2008 ice storm, Coderre said. In a survey of area communities, most of the businesses and homes in Marlborough, Plainville, Southborough, and Wrentham also lost their electricity during the storm, according to figures from National Grid. Though the majority had power back by Wednesday afternoon, that still left hundreds of customers waiting in the cold. ■ The entire town of Northborough - 6,473 utility customers - by 4 p.m. Sunday. Already angry over what happened during Irene, local officials were giving mixed grades to National Grid’s response to the second widespread power outage since late August. In Marlborough, Mayor Nancy Stevens said she hadn’t seen a big improvement over Irene in terms of the approach taken by National Grid. By Tuesday morning, still more than half of the city was without electricity. Stevens said that without an accurate estimate when power might return in different sections of the city, city officials could not make their own plans for dealing with problems. Marlborough was one of the communities that postponed Halloween trick-or-treating due to unsafe conditions. City resident Jackie O’Rourke had lunch at McDonald’s on Monday with her two sons, ages 5 and 9, while they waited for their electricity to return. In a message Tuesday afternoon, Wrentham Fire Chief James McMorrow said most of the town was still without power, and he was busy coordinating a delivery of water from state emergency officials, as well as message boards and auxiliary lights to control traffic at larger intersections. National Grid’s response was “slow at first,’’ said Coderre, Northborough’s town administrator, and nearly a third of the community still did not have power Wednesday afternoon. However, Coderre credited a “very big push’’ by the utility Wednesday evening that reduced the area without power to 1 percent of the town by Thursday morning. After coming under criticism for poor communication with local officials after Irene, National Grid reviewed its performance and made changes, said David Graves, a spokesman for the regional utility. As the snowstorm took its toll on the region, National Grid dispatched 100 “liaisons’’ to work directly with local officials. Many were community relations staff or managers. “One of the lessons learned from Irene is that we need to increase or improve the means of communication,’’ Graves said. State Senator Jamie Eldridge, a Democrat from Acton whose district extends into Marlborough and nearby communities, said concerns remain about both the response of the utility companies after major storms, and what seems to be the growing frequency of extreme weather. He said the problems the larger power companies were having stand in contrast with those facing communities that operate municipal electric companies, such as Littleton and Boxborough, which had more success getting the lights back on. Eldridge credited the swifter response to having local crews ready to go to work. By contrast, Eldridge said, he is concerned that the major power companies may not have enough crews on hand locally, and may rely too much on bringing in help from other states. But Captain Joseph Mauro of the Southborough Fire Department said he did see some signs for hope, with a National Grid employee in town to help coordinate operations. “It does seem to be working out a little better than it did during Irene,’’ he said. Millis Town Administrator Charles Aspinwall said he also saw reason for encouragement. By Tuesday morning, all but 87 homes in the town, which is serviced by the utility NStar, had their electric service restored. “Power came on sooner - that is indicative of something,’’ he said. Sullivan, the state’s top energy official, said he also saw signs that National Grid and NStar had made changes, but questions remain. State regulators will be looking closely at the response to the latest storm and an array of concerns, including whether local utilities are keeping enough repair crews on hand. Sullivan said it might also make sense to look at whether local utilities should start putting power lines underground, a practice common now in Europe. “If we are going to see in the future more high-impact, high-intensity storms, you have to think about a lot of things differently,’’ Sullivan said. Globe correspondent Michelle Cerulli contributed to this report.